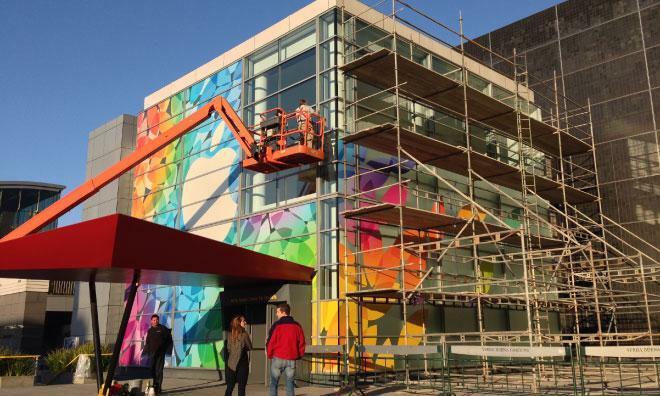 Apple's preparations for next week's iPad event are in full swing, as seen in progress photos provided by AppleInsider reader David Jones. With the decals nearly finished, a mosaic-like pattern designed from the multicolored "leaves" of Apple's logo has emerged. 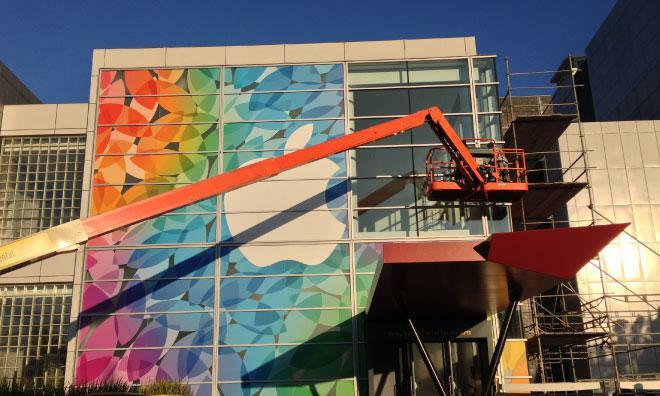 A large, stark white Apple logo is centered on the building's facade, just above and to the left of the entrance. Heading into the weekend before Tuesday's event, no additional details have emerged about what the company may unveil, though a rumor is circulating that the day may bring a hardware refresh for the Apple TV. Amazon's French and German sites began showing sudden unavailability of the device late Thursday with a restock date of Oct. 23, the day after the event. Apple is widely expected to take the wraps off of a redesigned iPad featuring thinner side bezels and an slimmer profile alongside a Retina display-equipped iPad mini at the event. The next-generation Mac Pro and OS X Mavericks are also rumored to get stage time. AppleInsider will be on site Tuesday and will provide live coverage as well as immediate hands-on time with any new hardware.